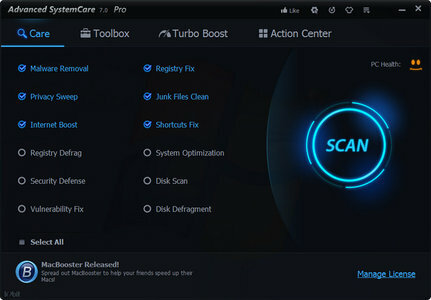 Advanced SystemCare Pro 7.4.0.474 สุดยอดโปรแกรมดูรักรักษาเครื่องยี่ห้อดัง ล่าสุด!! + System Optimization More stable and securer, and fully support optimization for Windows 8.1 latest version. + Privacy Sweep Added cleaning for iTunes, Microsoft One Drive, Real VNC 5, Tag & Rename, Tango, 3D Pinball Ultimate Demo, avg internet security, bing desktop 6.0 and blio. + Privacy Sweep Enhanced the cleaning for Winpatrol 31, Adobe Falsh Player 14.0, Thunderbird 31.0, Adobe Air 14.0. + Uninstaller 3.3 Boosted launching speed, enhanced Forced Uninstall, and improved File Shredder. + AutoCare Improved AutoCare to provide safer and smarter auto care service (PRO Only). + Latest Browser Fully supported Chrome 36, Firefox 31, and Opera 23. + Language Optimization Optimized a few language strings to clear up confusion. + User Interface Minor UI improvements. + Minor Improvements Fixed General Bugs.